If you've never seen (or only just noticed) the racetrack in roulette, it can look pretty confusing. When I first saw it I had no clue what it was for, and when I did try to place bets on the racetrack it just didn't seem to make any sense. As with most things though, once you actually know what's going on it becomes a piece of cake. So here's my quick and easy guide to the roulette racetrack. 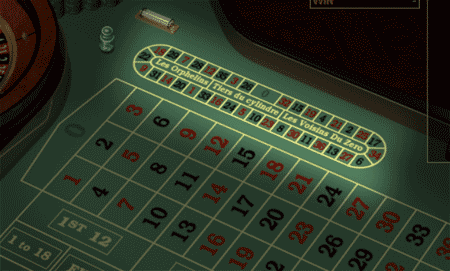 If you don't know what call bets in roulette are, you should brush up on those first. When trying to place call bets online, the racetrack is a much better alternative to the betting options text box that can be found at some online roulette tables. The racetrack obviously looks way cooler too. Text box version of the racetrack betting options. When the racetrack is available, it sits above the main betting area of the roulette table. It's referred to as the "racetrack" as it's a similar shape to a racing circuit (albeit a very small racing circuit). List of roulette sites with racetrack betting. What bets can be placed using the racetrack? On the inside (1, 2 and 3). 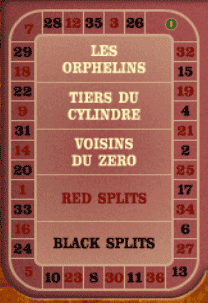 The voisins du zero, tiers du cylindre and orphelins call bets cover fixed sections of the roulette wheel. To wager on any of the call bets above, place your betting chip in the relevant section on the inside of the racetrack. The neighbours call bet varies depending on the starting number you bet on in the racetrack. 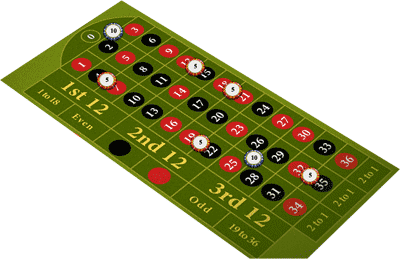 To place a neighbours bet, simply place a chip on your desired number on the outside "circuit" part of the racetrack. The main call bet missing from most racetracks in the final or "finale" bet, as there is no easy way to incorporate it in to the racetrack design. 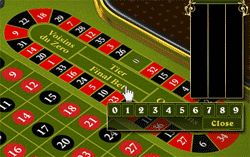 However, at some online roulette casinos they add a small "final bet" box in to the centre of the racetrack, which will then pop open with the various final bets when clicked. An example of how the "final bet" call bet can be incorporated in to the racetrack. How to use the racetrack. If you're playing online, the software will automatically recreate the actual call bet within the main betting area on your behalf. The computer will use the value of the chip you place on the racetrack as your basic betting unit for each individual bet placement. If the call bet requires 9 betting units in total and you placed a $5 chip on the racetrack to make this bet (i.e. voisins du zero), the total amount of money wagered will be $45 (9 x $5). An example of the bets placed on the table if you place a $5 chip on "voisins du zero" on the racetrack. To be honest, using the racetrack is pretty straightforward. Try it out for yourself in practice mode (or for real money if you're feeling fruity) and see what happens. Although the racetracks on online roulette tables generally follow the same format, they often have slight differences in style and design. Here are few examples of racetracks found at different online roulette casinos. This racetrack includes the option to place "final" call bets. 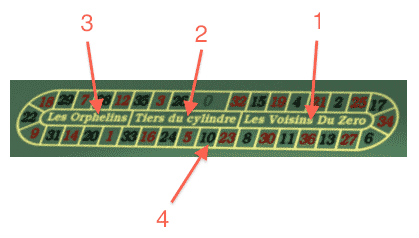 This racetrack uses the names "serie 5/8" and"serie 0/2/3" instead of "tiers du cylindre" and "voisins du zero". It also has a "jeu zero" bet. An alternative racetrack layout with added "red splits" and "black spits" bets. As you can see they're all pretty much the same, aside from a few different betting options here and there. These betting options are also available at mac compatible roulette sites. The numbers for the neighbours bets all go around the outside and the fixed call bets go in the middle. Easy stuff.